So I couldn’t not share this story about myself, MassHealth, and our completely dysfunctional healthcare system. After I left my old job to start my own Direct Care practice I needed to take on the more formidable task of finding my own health insurance that made sense for me and my family- we have two 5 year old twins. 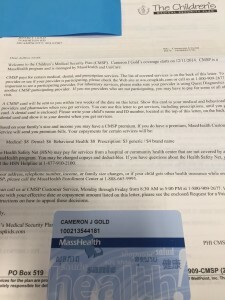 So I did what a lot of people did and went on the “Exchange” aka the “Connector” and entered all of our personal data including dates of birth, addresses, and of course estimated income. Now as I have always been an employed physician this was all new to me, but I felt that I would at least have some understanding and knowledge on how to shop for health insurance. Yet, after getting about 2/3 of the way through I put up my hands in surrender as I could not make heads or tails of anything. I can not even imagine what a lay person feels having to shop for something so convoluted and poorly organized. So I did the logical thing and called a local friend who sells other types of insurance and he connected me with a knowledgable professional that understands the health insurance market. He got me and my family what we needed at the best price possible. Then I just forgot about it…. Until yesterday September 14 2015, when I got home and checked the mail. 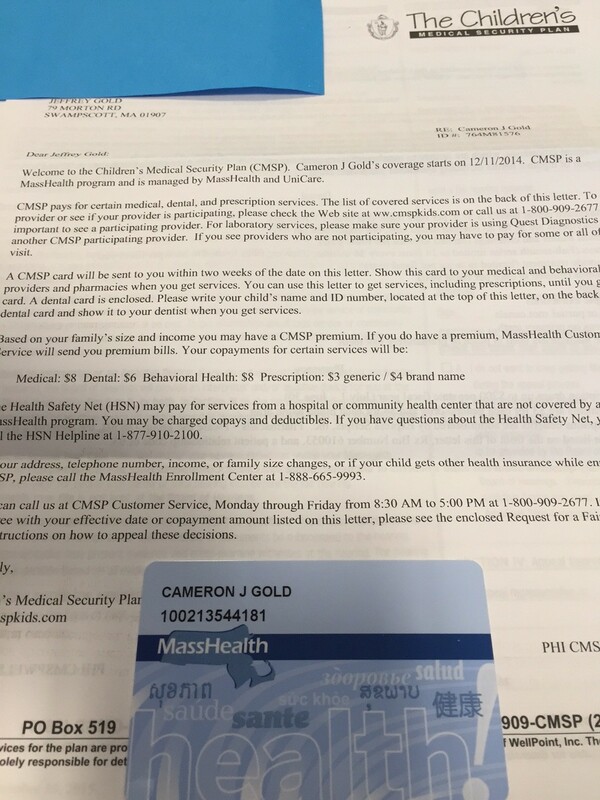 In there was a letter from MassHealth and The Childrens Medical Security Plan that my son Cameron- not his twin sister, not my wife, not me, just Cam- had been approved for a MassHealth plan effective DECEMBER 11 2014!!! Actually a separate letter states that “MassHealth is changing my premium payment because of a change in your family’s circumstances.” Huh???? What status change? I didn’t even know I was approved and paying a premium to them in the first place! Also enclosed was his card (as you can see in the picture above) for both medical and dental plans at a cost of $64 per month with really cheap copays- well for me that is. You may also notice that in the body of the letter there are not one, but three different numbers for me to call if I have various questions. Well I actually only have one question with two parts….1a. why in Gods name am I even getting this?! and 1b. how am I or any member of my family even close to qualifying for government subsidies??! Somehow just one of my family members qualifies for subsidized medical and dental care from our state and federal government but the rest of us do not? Clearly this is huge mistake based on some information that I input into the Connector back in January of 2015 right? So what should I do? Should I try to game the system and dump my more expensive, current insurance for my son and take this cheaper offering for him at the cost of the taxpayers of Massachusetts? Should I just wait and see all the administrative waste that will be used to figure this out and catch on to me and eventually correct the problem in another year or two? The answer to all of these questions for me is a resounding NO. Instead I will write a blog article about it that a few people will likely read and just chalk it up to another Dr. Gold rant on healthcare in the US. My deep hope, however, is that at some point more people will read this and actually think! What are other people doing with these healthcare mistakes and oversights that our government is making with your hard-earned dollars and taxes you pay? How much money is wasted if this mistake happens to 3,000 people that actually pretend they deserve the subsidy and use it? Is this what you want your money spent on? Waste? Is this really how you want your care to be delivered? Would you tolerate it if you paid an 800 dollar a month or higher premium for your families health insurance and found out that a friend paid 64 dollars a month due to a clerical error? Now do not get me wrong, I am for all people of all walks having good access to high quality, affordable healthcare, and there are ways that the government could help do this the right way. I will not get into all the gory details here, but one possible solution is working with Direct Care doctors like me and Iora Health to spend your tax dollars on something of worth- actual healthcare instead of bureaucratic, administrative waste. Now, I think I’ll go shred my sons new MassHealth card and save the state some money. I would rather stay true to the Oath I took and hope that it is spent on care for people whom actually need the assistance instead. Doubtful, but a doctor can hope right? Add a Direct Primary Care doctor to this image and you have true high-value health care. 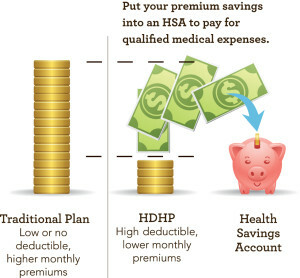 This post is in response to two excellent articles in the Ideas section of The Boston Globe today by Mark Pothier and Betsy Cliff Out-of-pocket Costs Put Healthcare Out of Reach and How Health Plans With High Deductibles Became the New Normal, respectively. Even more poignant are the comments that follow the online articles which I also suggest you read. It is published on the heels of the Supreme Court voting this week to maintain the subsidies to people who enrolled in the ACA through federal exchanges rather than state-based. (I will not express my opinion on this here). The overall consensus from these comments is that people are struggling to afford out-of-pocket health care expenses and have no idea how to shop as a consumer for affordable care. And this is not their fault, as they haven’t had to be a wise consumer with the cadillac insurance plans that “covered all.” Well these plans have gone by the wayside and with the Cadillac Tax from the ACA coming to employers soon enough, they will continue to disappear. So how do you go from being a patient to a consumer of health care as well? You get help. You get an advocate. You find a Direct Primary Care doctor whose main job is to care for you and find the most affordable, high quality care possible. I would not try to buy stocks or mutual funds on my own because I do not have the knowledge base to do so. So I put my trust in an expert to guide me through the process and invest my money wisely. How do you shop for healthcare in the state of Massachusetts where it costs the most? You pay someone directly to help you and advise you. You do not brave it alone. You find a Direct Primary Care doctor you know and trust. Direct Primary Care doctors are transparent, we are affordable, and we work solely for you rather than third party interests. We are your doctor first and your healthcare agent/broker second. So go to I Want Direct Care and place a pin down. Write to your local congressmen and congresswomen to tell them about Direct Primary Care and its benefits to you, employers, and the system as a whole. And then, even more importantly, please remember that Health Insurance does not equate to “Healthcare”, especially the affordable kind.